Suzuki India always takes pride in Access 125 as it is their model which is currently the highest selling model from their brand. It can be grouped as a world-class model which probably is one of the safest to ride in town which does fullfill your wishes if you stick on to have a safe buy. The model comes with exciting color options which are all eye catchy for all and what makes the model so interesting is that it is very user friendly. A perfect blend of style and power is what we can call this model. It is powered by a 125cc single-cylinder engine that produces 8.5bhp of power and maximum torque of 9.8Nm which is pretty cool. What makes it really worth a buy is some of its superb features such as telescopic front suspension for excellent ride quality, Maintenance Free battery, tubeless tyres, central locking system & unique shutter mechanism for a single control point convenience & safety which does indicate how the model is .Having got the unique multi-reflector headlamp with focused and brighter vision for safe night riding accompanied by the following five colors: Candy Antares Red (19A), Glass Sparkle Black (YVB), Metallic Sonic Silver (YD8), Pearl Mirage White (YPA) and Metallic Matte Fibroin Grey (PGZ).Having stiff ride quality lets it down a bit but being a 125cc scooter does makes thing pretty even to say the least. 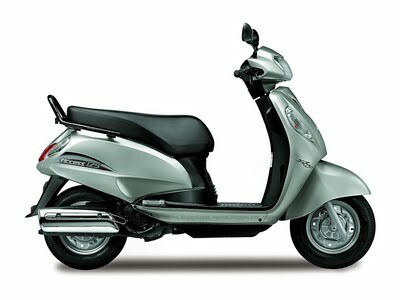 Honda activa 125 seems to be the most toughest opposition model for access 125.But being more economical and considering other factors like style and performance, Access 125 obviously has the upper hand. Access 125 comes in under a price tag of around Rs.53000 which when we sum it up wound end up indicating that the model is a safe buy…Go for it…!! Keep visiting the site for more updates.